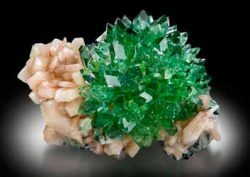 Discover the Crystals of India at HMNS at Sugar Land. Originating from India’s Deccan Plateau, a large geologic formation that comprises most of the southern part of the country, the exhibition features a never-before-seen collection of almost 50 of the most beautiful and most perfectly formed natural mineral crystals ever found anywhere in the world. The beds of basalt rock within which these crystals were formed and found, were created by massive lava flows from enormous volcanic eruptions that occurred more than 65 million years ago. Some paleontologists speculate that these massive volcanic eruptions may have even accelerated the extinction of the dinosaurs at the end of the Cretaceous period. For this exclusive engagement, the temporary exhibition hall at the HMNS at Sugar Land will be transformed into a jewel box that will highlight these exquisite mineral masterpieces in a setting more befitting an installation of the crown jewels—made complete with dramatic lighting and custom display cases. The pieces on display in Crystals of India represent the “best of the best” and were high-graded from a collection that has been painstakingly assembled over the last several decades. These beautifully crystallized, natural mineral specimens (fittingly dubbed “The Flowers of the Mineral Kingdom”) were carefully excavated from quarries throughout India over the last half century. It is safe to say that tens of thousands of quarry workers blasted apart—and picked through—billions of tons of rock, by hand, in order to preserve these breathtaking mineral treasures for our visitors to enjoy. Crystals of India is organized by the Houston Museum of Natural Science. Locally sponsored by the City of Sugar Land, Frost Bank, and Sudha Chittaluru, M.D (Internal Medicine) - First Colony Primary Care. Visit Sugar Land Convention & Visitors Services.